The Coincheckin faucet is a Bitcoin faucet that adopts an interesting idea to decide how much you get on each dispense as an award. 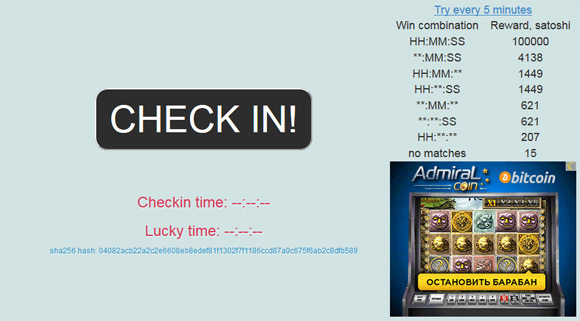 You check-in at specific time and then a lucky time is generated, depending on the matching hours, minutes and seconds of the two timestamps you get a reward. If there is no match you get 15 satoshi, for matching Hours you get 207 satoshi, for matching seconds or minutes you get 621 satoshi and if you match two or three of the numbers the awards increase further all the way up to 100000 satoshi for a complete match. You can check-in the faucet every 5 minutes to test your luck and once you get at least 5900 satoshi total in your balance you will get paid every Monday directly to your Bitcoin wallet. To get some extra profit from the service you can take advantage of the affiliate program that awards you with 50% referral bonus if you invite your friends and they start using the faucet.